The Hoopster is a simple, rugged four-person, four-season shelter designed for trekkers who want a dry bombproof place to cook, eat, sleep and hang out while waiting out a gale or blizzard. Featuring a DAC center pole and a floating Trussring®, it uses fabric structurally. Its traditional round shape deflects relentless winds; its floorless design allows it to be set up high for maximum ventilation or in hunkered-down mode to weather the worst storm. Optional floor adds versatility. Industry leading DAC Pressfit™ poles. place to string a clothesline. Single door opens wide for stargazing. 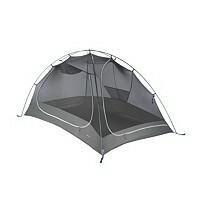 Trussring tents can be set at different heights to optimize ventilation or protect users from outside weather.